Purchase energy-efficient ducted or ductless air conditioning units (see below for rebate incentives). Use fans instead of air conditioners. Even if you use your air conditioner, use fans to circulate cold air and save energy and money. Check to see that windows and doors are closed when cooling your home. Turn off fans when room is not occupied. Add tinting to windows, close drapes or shutters or plant shrubs and trees on east and west exposures. Purchase ENERGY STAR® washers and dryers (see below for rebate incentives). Wash full load of clothes in cold water. 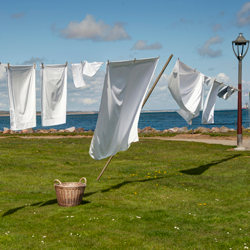 When possible, hang clothes instead of using a dryer. Clean the lint screen every load to reduce energy costs and help prevent house fires. Periodically inspect your dryer vent to be sure it is not blocked. 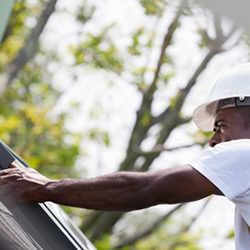 If you are replacing your roof, buy roofing with an ENERGY STAR® label. Select new roofing that is light in color. Apply a reflective coating to an existing roof to bounce off the sun’s rays. It is like thick paint, and you can do it yourself. Consider installing a green roof on your home. A “green” roof, planted over a waterproof film in soil, provides insulation for your home and lowers your indoor temperature. Contract with a licensed, experienced professional. 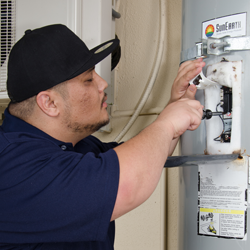 Purchase an ENERGY STAR® unit when buying a new refrigerator or freezer. Don’t set the temperature colder than necessary. Set the refrigerator temperature between 36º F and 42º F. Set the freezer control between -5º F and +6º F.
Clean dust off the coils and filters. Check the rubber seals on the door. Replace if worn. Reduce the heat. A fast boil does not cook faster than a slow boil, but it does use more energy. Don’t peek in the oven. Every time you peek, the temperature drops 25º F and requires additional energy to bring the temperature back up. Use retained heat. 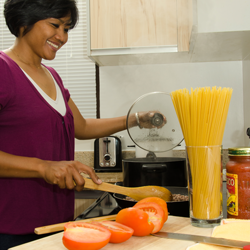 Turn off cook tops or ovens a few minutes before food has completed cooking. Put a lid on it. Cook food and boil water in a covered container. 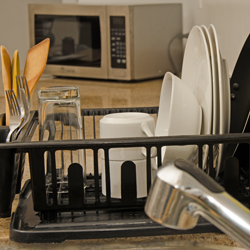 Air drying dishes instead of using the heated dryer setting on your dishwasher can save you 110 kWh and $20.89 per year. Fix a leaky faucet. A leaky faucet that drips just one hot water drop per second costs you 400 kWh and $75.98 per year. Shorten your showers by just two minutes. Each shower could save you up to 233 kWh and $44.26 per year per person in your household. Plus, you’ll save on your water bill too. WaterSense shower heads can save water. They can save enough to wash 70 loads of laundry and conserve enough energy to power a home for 13 days a year. Purchase an energy-efficient model. Consider tankless models. 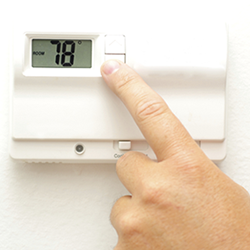 Set the heater to 120º F.
Repair any dripping faucets promptly. 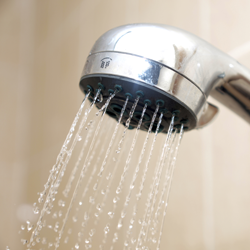 Use low-flow showerheads and aerators on faucets. 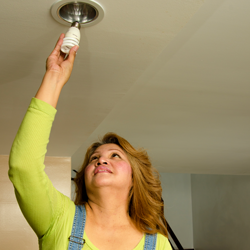 Use light-emitting diodes (LED) bulbs or compact fluorescent lamps (CFL). Use motion-detecting switches on outdoor lighting. When designed well, LED lighting can be more efficient, durable, versatile and longer lasting—so consider the long-term benefits of LEDs when making your purchasing decisions. Because CFL bulbs contain a small amount of mercury, they must be handled and disposed of with extra care. Please click here for more information. Achieving more savings by fixing a leaking faucet or twisting on an aerator, costing only a few dollars. Turn off the water while brushing your teeth or shaving. Less water down the drain also means less energy to deliver and heat water. 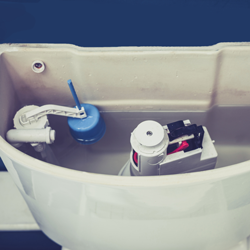 If you can’t replace your high volume toilet, install a dual flush valve or put a plastic bottle filled with water in your toilet tank to reduce the amount of water used. please call the GPA Customer Service Center.